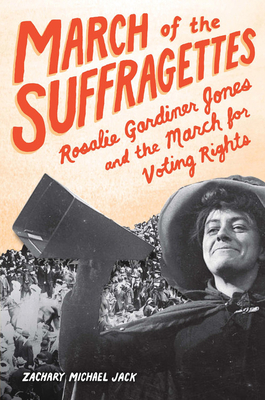 March of the Suffragettes tells the forgotten, real-life story of "General" Rosalie Gardiner Jones, who in the waning days of 1912 mustered and marched an all-women army nearly 175 miles to help win support for votes for women. General Jones, along with her good friends and accomplices "Colonel" Ida Craft, "Surgeon General" Lavinia Dock, and "War Correspondent" Jessie Hardy Stubbs, led marchers across New York state for their pilgrims' cause, encountering not just wind, fog, sleet, snow, mud, and ice along their unpaved way, but also hecklers, escaped convicts, scandal-plagued industrialists on the lam, and jealous boyfriends and overprotective mothers hoping to convince the suffragettes to abandon their dangerous project. By night Rosalie's army met and mingled with the rich and famous, attending glamorous balls in beautiful dresses to deliver fiery speeches; by day they fought blisters and bone-chilling cold, debated bitter Anti-suffragists, and dodged wayward bullets and pyrotechnics meant to intimidate them. They composed and sang their own marching songs for sisterhood and solidarity on their route, even as differences among them threatened to tear them apart. March of the Suffragettes chronicles the journey of four friends across dangerous terrain in support of a timeless cause, and it offers a hopeful reminder that social change is achieved one difficult, dauntless, daring step at a time. Zachary Michael Jack is an award-winning author and editor of over twenty books, a former youth and bookmobile librarian, and a founding director of an Iowa-based summer arts school for young adults. He has served as a visiting writer or writer-in-the-schools at school districts and school libraries across the country and as the lead instructor for a popular writers’ workshop for 'tweens and teens, the Master Class for Young Writers. An associate professor of English at North Central College, the author teaches courses in Leadership, Ethics and Values, and Writing for Social Change, among others. Zachary’s most recent book of nonfiction celebrating women’s history, The Midwest Farmer’s Daughter: In Search of an American Icon, has been featured on National Public Radio affiliates across the Midwest. - ZACHARY MICHAEL JACK has published more than twenty award-winning books in a variety of genres, including fiction, poetry, literary journalism, creative nonfiction, and personal essay. - His nonfiction has received nominations for the Pushcart (Best of the Small Presses) Prize, the Theodore Saloutos Award, the William Hill Sports Book of the Year Award, the Herbert Warren Wind Award, and the Shambaugh Award. - The author and his work have been featured in USA Today, the Los Angeles Times, the Chicago Tribune, the Indianapolis Star, and the Des Moines Register, among many others.